The Healing Family Foundation celebrated its three-year anniversary on November 8, at the Sara Rajamangla University of Technology on Huay Kaew Road. Pictured are Healing Family Foundation volunteers at their 3rd Year Anniversary party. The foundation is located at Baan Sanook, (literally translated as the house of joy), in Tambon Wat Ket, and was founded in 2005 by a group of parents. Its working principle is simple and straightforward - it aims to provide a space in which people with disabilities, (mainly intellectual), can enjoy themselves! Guests of honour at the celebrations included the Japanese Consul General. After the welcoming speech by Pradit Prachanont, the foundation’s president, the indomitable Baan Sanook dancers entertained, to the delight of everyone present. The kids from Star Fish Home in Chiang Mai also took part, and one of the highlights of the day was the little kids with their balloons. Other highlights included a Furoshiki workshop, fashion parades and a short history of the foundation. Altogether, a fun filled morning, enormously enjoyed by all. charms guests at the party with his wonderful voice. A ‘welcome back’ party involving local media was held November 11 at the Imperial Mae Ping Hotel’s beer garden, to celebrate the return of Prahpan Kodpetch as general manager of the hotel - for the second time! Praphan served as general manager at the Imperial Mae Ping between 1988 and 1998, following which he transferred all over Thailand, working for hotels in the same group, before being persuaded to return after 10 years’ absence! Left to right: Nittayaporn Polsri (Hotel Manager of IMM ECO), Thanadon Thibkham (Hotel Manager of CHH Hotel), Praphan Kodpet (GM of The Imperial Mae Ping Hotel), Chanon Sabphasri (GM of The Imperial Chiangmai Resort and Spa Sport Club Hotel) and Sirijan Sapapak (GM of Eurasia Hotel). This time Phrapan has further responsibilities, for the IMM ECO, (which opened the previous week), for Eurasia Chiang Mai, for the CH Hotel adjacent to the Night Bazaar, and for the Imperial Chiang Mai Resort at Mae Rim. With his bubbling personality and wide experience, he will surely bring an added sparkle to all the venues. In addition to all the above, the group is taking over the Suriwong Plaza opposite Thapae Gate, and , next year, will be opening yet another hotel at the location, IMM Tapae, which, in keeping with the difficult times, will be a 3 star hotel with, according to Phrapan, the facilities and comforts of a 5 star! Phrapan is married to a Chiang Mai lady, and has a home here in the city, so is doubly pleased to be back. The managers of the group’s other venues in Chiang Mai and the staff of the Imperial Mae Ping seemed more than pleased to welcome him home, as well! What began as an enjoyable press reception turned into a great, fun filled evening before the speeches began, when Phrapan, having mingled previously with the guests, was pedalled in on a rickshaw, jumped onto the stage, and treated everyone to an amazing rendering of that great Tom Jones hit, “The Green, Green Grass of Home”. He simply” knocked everyone dead” with his gorgeous baritone voice! Obviously, the Imperial Mae Ping’s gain was show business’s loss. Even passers-by stopped to listen, then came in and joined the party, together with guests staying at the hotel, some of whom joined Phrapan on the stage and added to the fun and amusement of all. Towards the end of the evening there were prize draws, with vouchers from sister hotels around Thailand up for grabs. 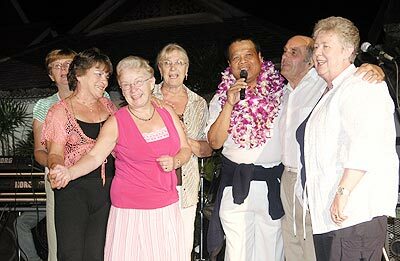 All in all – Praphan looks and sounds as though he’s going to shake up this grand hotel and put it back to where it belongs - ‘the place to stay and the place to see and be seen’, enthusiastically assisted by the members of the local media who’d had such a great time welcoming him! We wish him luck! If you are holding an event invite the [email protected] chiangmai-mail.com to make it that little bit more special. Chalermsak Suranant, director of the Tourist Authority of Thailand’s Chiang Mai office, has welcomed the opportunities presented by the ASEAN Summit’s last- minute relocation to the city, saying, “Chiang Mai is ready. We have 418 hotels, with 20,816 rooms in total - 45 of these hotels are 4 star plus or above. Our city is famous for its restaurants, which suit all taste and budgets. Conference facilities have been greatly increased with the opening of the Shangri La, Le Meridian and the Empress Conference centre, which are able together to accommodate over 5000 people. The ASEAN summit will be held between December 15 and 18. When the news was announced on the morning of November 5 that Barack Obama had been elected the 44th President of the United States, folks across Thailand echoed the collective elation exhibited in America. In Chiang Mai, the US Consulate was packed with expatriates and Thais alike, hanging on the words of CNN anchors distributing election statistics. Businesses paused in their work, school children were unable to focus, and teachers easily acquiesced to watching the vote count with them. The wave of sentiment was infectious. 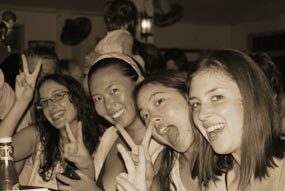 Chiang Mai University’s visiting American public health students, from Washington State, are seen at the UN Irish Pub celebrating Obama’s victory. The same night, at the UN Irish Pub, the Chiang Mai Democrats Abroad exploded into celebration as over 200 ecstatic people gathered in a miniature version of Chicago’s euphoric crowd in Grant Park. People waved Obama memorabilia, there were hugs all around, tears of joy, and a sense of hope in the air. The new senate seats were announced over the clinking of mugs of beer and the excited political chatter of people embracing fundamental changes in the United States and the world. So great was the emotion of the group that the band scheduled to play live decided to join the party instead. Donations to Democrats Abroad rolled in amid overwhelming pleas for more Thai/English Obama t-shirts. In attendance were American lawyers, students at Chiang Mai University, teachers and administrators from various international schools, leaders at local NGOs, political activists, and, of course, the publicly non-partisan American Consulate General. Surprise was warranted, however, for the number of non-Democrats and even non-Americans present. The number of Independent voters and long time Republicans who cheerfully came to the Pub seemed to be a testament to Obama’s acceptance speech message, in which he promised that, for those whose respect he hasn’t yet earned, he looked forward to being their president too. Democrats Abroad welcomed Thai, British, Canadian, Australian, and Swedish people and their families to the celebration in what was a phenomenon of global festivity. In Kenya, the birthplace of Obama’s father, a national holiday was declared. In England, the Sun newspaper borrowed from Neil Armstrong’s 1969 moon landing in describing Obama’s election as “one giant leap for mankind.” French president Nicolas Sarkozy and former South African President, Nelson Mandela wrote exuberant letters of congratulations to Obama and the American people. Jakarta, Bangkok, and Tokyo saw the largest public rallies of celebration over the election of a US president ever. The Democrats have won an important victory. Not only will they control the Executive Office once Obama is inaugurated in late January, but they also gained further seats in the majority Democratic senate. Though Democrats failed to take the 60-seat majority needed to halt Republican filibusters, they earned a wide majority in both the House and the Senate for the first time since Bill Clinton was president in 1995. Old voting patterns have also changed and will cause Republicans to rethink their election strategy in the future. The first black president was elected, 126 years after African American men first got the right to vote: 13% of the African American population voted, as opposed to 11% in the previous presidential race. Worse still for the future of the Republican party, 70% of first time voters elected Barack Obama. The only age group that wanted 72 year old Senator John McCain as their president was the age group 65 and older, reported the New York Times. Come support Care for Dogs at our charity fundraiser at the hippest little bar in town. Enjoy a fun evening with delicious cocktails, wine, finger food, cheese, live auction, raffles and live music. The auction and raffles will include great items, donated with thanks from popular hotels, restaurants and local artists. All proceeds will go toward homeless dogs in need, who are being lovingly looked after in every way by Care for Dogs. On November 9, Patricia Cheesman hosted the opening of her latest exhibition at Studio Naenna, entitled ‘Woven Wisdom’. The exhibition, which will be open until next February 28, is held in homage to ancient Thai weaving knowledge and tradition, passed down through generations of female weavers. On display is the work of master weaver, Viroy Nanthapoom, whose ability to interpret Patricia’s designs and teach 40 weavers the skills of ikat weaving is truly remarkable. 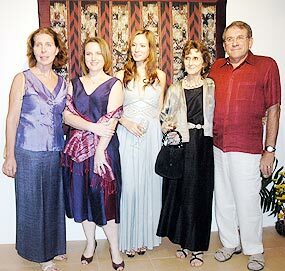 Pictured at the opening (left-right) are Lori, Lamorna, Susi, Patricia and Ken. Patricia was joined at the opening by a great number of friends and, of course, her family - her two daughters Lamorna, who now manages Studio Naenna, and Susi, who has become a famous model and actress on Thai TV Drama Channel 3. Vithi, who founded the Thai section of the Fine Arts Department at Chiang Mai University (CMU), was previously a dancer, and as a special treat a number of his protégés danced for the guests at the opening. Their performance was a mixture of Thai Spirit Dance, Burmese Nat Dance and Balinese Trance Dance, and was created by the students and inspired by Vithi especially to enhance the textiles. After the dance, Manop sang ‘Noi Jai Ya’, a traditional song based on a Huay Kaew Waterfall Love Story. Studio Naenna is located at 138/8 Soi , Changkhian, Huay Kaew Road, Chang Puak. Opening times are Wednesday from 10am until 4pm. Please call first on 053-226-042. For further information, please visit www.studio-naenna.com.